Having made a British designed and made pair of horn speakers the subject of my first review for Dagogo, I subsequently attended the UK National Audio Show at Whittlebury Hall, just up the hill from the British Grand Prix circuit of Silverstone. Curious to discover other European manufacturers taking a horn-based approach I visited LW Audio’s room at the show where proprietor Iain Borthwick was demonstrating a pair of Horning Eufrodite Ellipse PM 65 speakers. The Danish speakers were being driven by Chinese designed and made 120 Watts per channel Audio Music 833 monoblocks. The Eufrodites sounded pretty good and looked interesting. Well, I guess the Hornings are big by the standards of some speakers, but not big by the standards of others. Everything is relative. I think I know what she means though. She’s used to the Audio Note Es that huddle discreetly in the corners of the room, and even though Horning Eufrodite designer Tommy Horning intends his speakers to be put similarly close to the corners, that proved impossible in my room. The result of such placement was a massively muddy sound, boomy bass and almost no top end. It was only after moving the Horning Eufrodite Ellipse PM 65 around for some twenty or so minutes that Iain finally declared himself satisfied with the sound. The Eufrodites are not the first full range speakers to be troubled by my listening space. It is just over 21 feet long and 12’ 6” wide, but it has a low ceiling at just over 7 feet. Audio Note Es of various levels work exceptionally well, as do Acoustic Energy Reference IIIs, to name but two examples. 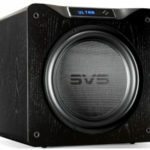 Big ProAcs, B&Ws, Vandersteens and PMCs have all to a lesser or greater degree required careful positioning to dial out as much as possible the easily excited bass room nodes. Some – most notably the ProAc 3.8s – just never settled. However, with their front baffles 51 inches from the front wall, and toed-in to cross in front of the listening position, the Horning Eufrodites sounded much more at home. This raises the question of whether I should have abandoned the review and simply returned the Eufrodites to the UK distributor who had gone to so much effort to deliver and set them up. Let me answer that in this way. My room is not a one-off. There are many audiophiles whose listening spaces are, like mine, divergent in one way or another from what Cardas describes as having a golden ratio. In the context of an overall positive review, I point out aspects of performance that may cause readers similar problems if, as in this example, their listening space shares similarities to mine. Give Tommy Hørning his due; in one way he has been nothing if not consistent for over a decade now. The Horning Eufrodite Ellipse PM65 speaker was launched in 2002 and since then he’s tweaked and plucked, refining the same essential layout; the current model that I auditioned being the MK 5. It’s excusable to be in two minds about this restless search for perfection: on one hand we might applaud the determination and refusal to settle for ‘good enough’, but on the other hand owners of earlier Horning Eufrodites, seeing the value of their purchases undermined by the launch of successive new models, might have a less than approving response. 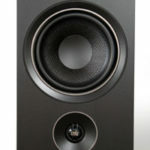 It has to be noted too that the Horning Eufrodite Ellipse PM65 speaker has escalated keenly in price – a stout difference of some $8,000 separates the Mk IV and the current model, launched just a few years apart. Tommy Hørning would surely counter – and with some justification too – that the Ellipse PM 65 is considerably more costly to make than the earlier versions of Eufrodite. 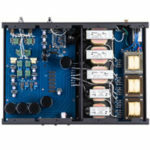 Not only does it use a larger and more expensive Lowther driver, the cabinet is more complex and thus more expensive to manufacture also. Finally, there has to be factored into the MSRP a reflection of what the designer believes is the sonic performance comparative to alternatives at a similar price point. The Horning Eufrodite Ellipse PM65 stands 48 inches high, 13 inches at their widest point and 23 inches deep overall. Viewed from above, the sides of the cabinets are elliptical, narrowing at the front baffle, and at the back too, to just 9 inches. They are executed in ply and MDF with internal bracing. Each weighs some 140 pounds, so are not trivial things to unbox and move around. They are supplied with composite rubber-like feet, but Tommy Horning is resigned to the inevitability that buyers in countries other than Denmark will likely prefer spikes or other supports. The front baffle has a removable cloth grille from top to bottom that is just 7 inch wide. 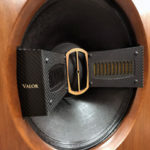 Combined with the very attractive apple wood veneer that my review pair came in, the narrowness of the front baffle and even narrower grille really do help to minimize the visual impact of the Eufrodites. Even though they occupied useful floor space in my listening room when positioned forward as they had to be, I did not feel that they had an overwhelming presence. The tweeter chosen by Tommy Horning for the Ellipse PM 65 is a lightweight spiderless design modified with a larger magnet to get the efficiency up to 99dB. “It goes over 20 KHz and is in my view far better than any ring radiator or dome tweeter,” he says. The midrange unit is a Lowther PM 65, and no, you won’t find it on Lowther’s product list. It’s a 6.5-inch driver with a 2.45 tesla alnico magnet and a dynamic mass of just 5.5 grams. Standard 6.5-inch drivers are designed to work over a 30 Hz to 22 KHz range, but Horning removes the whizzer cone from the centre of the driver and glues in its place a cloth dust cap, resulting in a unit that rolls off acoustically at around 6 dB per octave below 200 Hz and is integrated with the tweeter by use of a single Jensen capacitor at a crossover point of 12 KHz. wiring: Horning reference cable: soft annealed ultra pure 99.999% copper wire. 300 individually isolated 0.1mm strand. Covered with natural silk. Thank you for your euphrodite review but to be honest for my opinion it’s very difficult to judge any kind of loudspeakers in a listening room like that….. In a very wonderful way.